I was recently approached by Slooh to provide footage for their Supermoon show last Sunday. Slooh runs a network of telescopes around the world and provides their customers with remote access to them for a small fee, but also broadcasts live shows for significant astronomical events. Now no astronomer really cares about Supermoons, because they’re not rare and not easy to tell apart from regular full moons, but it seems to get the public excited and that’s really important. If we can leverage the hype to get people looking up and paying attention to the universe around them, well why look a gift horse in the mouth? The email was addressed to me in my capacity as a section director of the Astronomical Society of South Africa, as well as several other ASSA officers. “We’d like to show video clips of the moonrise from around the world or our show”, it said. I put out the word, but the more I thought about it, the cooler it sounded to record my own footage and send that in. It was going to be a challenge – I’d never successfully recorded video with my imaging rig before, largely because of trouble converting from the camera’s native uncompressed .MOV format to something a little more portable. As the day approached, and the number of responses to my own emails leveled off at a steady zero, the pressure began mounting. If I was the only photographer to send in my material, then I would be representing my country with less-than-ideal equipment and about 5 minutes total experience of video astronomy. The more I thought about it, the harder it began to seem. I only have two lenses for my camera: The 18mm-55mm kit unit that came with the camera when I bought it, and a Celestron C8 telescope and Focal Reducer combo which together function as a 1260mm lens fixed at f/6.3. The small lens at it’s longest focal length render the Moon as a tiny disc against the sky, which would make for a pretty uninteresting video. The telescope, by contrast, almost fills the entire frame with the lunar disk. That makes for a pretty spectacular picture, but such a narrow field of view makes it really hard to find your target. To make matters worse, it wasn’t the Moon itself that interested me, but the moonrise. I had to aim at exactly the spot on the horizon where the Moon would be rising, and then start recording no more than a few minutes before it actually appeared – my DSLR camera is designed for still images and therefore only does short video recordings. Fortunately, I’d found a very useful web app designed to solve this exact problem: The Photographer’s Ephemeris. Just find your location on the map, enter the date of your planned shot, and get a topographical relief map of your neighbourhood with lines showing where the Moon and Sun will rise and set, along with exact times. Unfortunately it doesn’t quite give an accurate enough result to aim the sort of shot I was expecting to make, but I would at least be close enough on target that I could correct my aim in a few seconds and so catch almost the entire event. With that problem solved, the rest of the project began to look easy. Take the telescope off its equatorial mount and stand it on my porch table. Attach the camera, and aim it at the correct landmark on the horizon (which conveniently turned out to be the edge of the tree line on a nearby hill), focus on the most distant point I could find, and then turn off the camera to wait for the big moment. Unfortunately, things did not go as planned. At about mid-day, the wind picked up, until it was strong enough to buffet the telescope. The movement wasn’t obvious, but at the level of zoom I would be achieving, the picture would leap and bounce around uncontrollably. That was a problem. But worse was yet to come: clouds. A thick carpet of patchy cloud settled in, leaving only the occasional gap through which I could make out the blue sky behind. 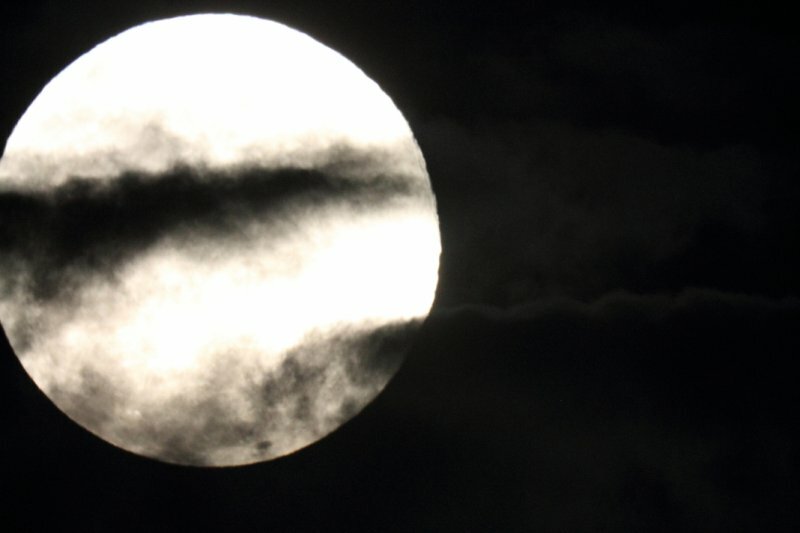 The weather reports promised that it would clear up as the sun set, but would it be enough? As it turned out, no. Five minutes before the event, and ten minutes before sunset, one stubborn layer of cloud remained above the Eastern horizon, exactly where I was waiting for the Moon. The wind had settled somewhat, but was obviously still raging above from the way those clouds were scudding to the South. So I turned the camera on and began recording, just in case. Interestingly, the clouds were so distant that they appear a uniform blue in the video. In fact, the first ten seconds of the video I eventually produced does actually show the moon rising, it’s just behind the clouds that look like blue sky! As the minutes rolled by, the camera reached its maximum movie length and stopped recording. As the sky darkened, I scanned the sky for some sign of thinning clouds, or glowing moonlight, but saw nothing. The next few seconds of the video, dark and grainy, and focussed on a different tree, come from this period. I repeated this cycle several times, following the diffuse glow in the clouds, constantly losing hope until, a full half hour after the Moon had actually risen, I caught my first glimpse. A tiny crease in the top layer of the clouds let a moonbeam through, looking like a bright star to my naked eyes but showing as a definite slice of Moon to the camera. From then I tracked the Moon for a few minutes, trying to adjust the exposure settings to a reasonable level before deciding I was satisfied with what I was seeing. I stopped tracking and allowed the Moon to drift off the edge of the frame. That sequence makes up the bulk of the video. I had my raw footage, but now I had to turn it into a usable movie, and get it to Slooh in time for their show. And I had to do this while fulfilling my various dadly duties around the house – bathing kids, making dinner, and generally easing the burden on my pregnant wife (Oh did I mention? My wife’s pregnant again! Please send money. Kids are way more expensive than telescopes and cameras!). In other words, I had about three usable hours to learn video editing, compress about thiry minutes of footage consuming more than three gigabytes into something manageable, and upload it to Slooh’s ftp server. Phew! Well the short version is that I eventually just dumped the raw video onto my wife’s computer which has Microsoft Movie Maker (she’s still running Windows 7, bless! ), and did the dirty work. The resulting file was still over 300MB, though, and the deadline was only a half hour away. So I plugged it into AviDemux and applied the most brutal compression I could, reducing the resolution to something embarrassingly low in the process. That got me down to 7MB, which I could easily transfer on time. Sadly, this meant that what Slooh actually broadcast was quite a poor quality movie, made worse by the fact that it was in a widescreen format, and they squeezed it into a more traditional format causing the Moon to be shaped like an egg standing on its end. Very sad, even though the presented did have some lovely words to say about what I gave them. Slooh did run a repeat of the show on Monday, but I doubt it will be made available again. However, I have uploaded the high quality version onto Youtube, and embedded it below. So please watch it, and tell me what you think!